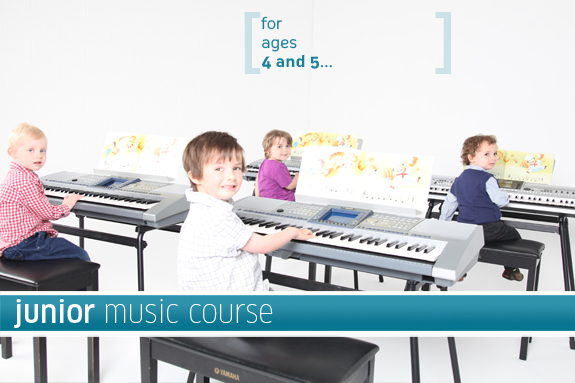 Junior Music Course is the best possible introduction that your child can have to the world of music. Open to children starting between the ages of 4 and 5, it offers them a unique chance to make music during a critical period in their development. Ninety per cent of our students achieve perfect pitch and the benefits in terms of their physical, emotional, social and intellectual development are immense. Our teaching methods are closely related to the way in which your child learned to speak – by listening and copying sounds. In JMC your child will first of all listen to the music then copy it through singing, playing the keyboard and then finally consolidate their skills by reading and writing traditional notation. Your child will receive a one hour lesson per week covering singing, playing Keyboard games and repertoire, Music Appreciation, aural training, reading and writing notation to name a few. Classes are taught in groups of up to 10 children and through making music together the confidence and self esteem of the children gets a huge boost. Many parents report that their child’s listening and social skills are considerably enhanced. To maintain the concentration and motivation of these young children for a one hour lesson the teacher will have prepared at least thirty different activities, blending concentration, relaxation, sitting and standing activities. And as a parent you are actively encouraged to join your child in the classroom to share the fun! Book a free taster lesson on Junior Music Course in order to experience this fantastic course for yourself.